The Habitat ReStore provides a more affordable avenue for purchasing the materials you need to complete your home improvement and (re)decoration projects and is a great place to find both ‘staple’ items and those special, unique gems you might be searching for! The ReStore depends upon community donations for our used product inventory. Donations arrive daily and inventory changes rapidly! 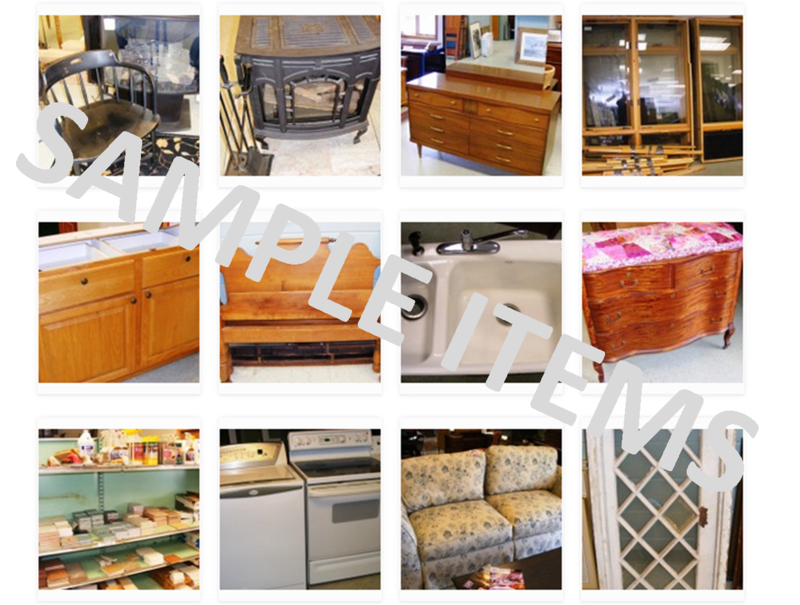 SAMPLE ITEMS ONLY – Items pictured below are representative of donations we receive and process for sale at our ReStore location in Ellsworth. Please check out our FaceBook site to see many of the items in our ever-changing inventory. APPLIANCES – REFRIGERATORS, STOVES, WASHERS, DRYERS! The best discount in town on used appliances! FURNITURE – COUCHES / SOFAS, OTHER UPHOLSTERED PIECES, DINING AND KITCHEN SETS AND MORE! We offer an eclectic selection of unique couches, sofas, and chairs plus an elegant selection of new and used dining room and kitchen sets! CABINETS – We offer discount cabinets in various finishes at DIY competitive prices. DOORS, DOORS, DOORS, WINDOWS, WINDOWS, WINDOWS – We have a WIDE selection of interior and exterior doors and double-pane windows at very good prices for your renovation budget. PLUMBING – We offer sinks, new lavatories, tubs and hardware / fittings. ELECTRICAL – Outlets, switches, conduit, wire, fixtures, etc. LIGHTING – INDOOR & OUTDOOR – Gently used lighting fixtures arrive almost daily in all styles and colors. FLOORING – Create the look for less using our donated tile, laminate flooring, bound carpet / area rugs, etc. Thank you for contacting us, Jane. The ReStore is open to the public Wednesdays through Saturdays from 9:30a.m. until 4p.m., located next to Jordan’s Snack Bar in Ellsworth @ 218 Downeast Highway. We do currently have a large selection of tile, some wall-to-wall carpet sections as well as small rugs, and some other types of flooring. Please stop by or call if you have a specific need (667-3082).